Dear beloved in Christ Jesus ! Wow! We are so thankful to the lord whose mercy endureth for ever and ever. I give all praise, Honour and Glory to His name alone. Amen. Doing great and hope the same from you and your blessed family. I pray that His perfect will be done in our lives and may His name alone be glorified through us in all we do. May His rich anointing flow through us to reach the lost. It is my honor and privilege to share with you that by His abundant grace and through your valuable prayers we have been reaching the lost, especially the Tribal people. 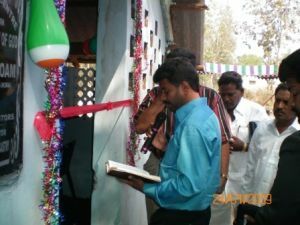 On 24th of this month we have dedicated a New temporary church in Steel city, Vishakapatnam, which I am sending you the pictures. Please pray for the pastor and the church. Thank you so much, as your prayers are making a great difference. Yes, we all know that prayer changes things and the prayers of His righteous are powerful and effective. Even though the whole world is facing the economic melt-down we all know that our Lord is still on His throne. Amen. Please do continue to uphold us in your prayers. I once again thank you for your prayers as they are supporting and strengthening us to reach the lost at any cost, which may even cost our lives. We are least bothered for our lives as we are going to be rewarded in Heaven. Silvi feels God is using him in different parts of his nation of India by focusing on the tribal people and the unreached villages. Silvi and Phebe started their church in the city of Suryapet in 1997 with seven people. Today, they are one hundred people, holding pastor's conferences, gospel and healing crusades and have formed a prayer network with 2300 pastors connecting twenty-three districts of the Andhra Pradesh state in south India. To visit the Kothapally's website, click here. This warms my heart to the fullest. I met Pastor Silvi at the World Conference in June of 2008. At this time my heart was touched with his love for the church and those that are lost. It is an exciting hour for the church; I know that our Lord has positioned Pastor Silvi and Phebe for a time such as this! It is the hour of shaking for the church and all that is not of Him will be separated but the truth will prevail. I am so grateful for the obedience of this man and woman to stand in the place they have been called and do it from a willing and loving heart of our Father. Thank You both for showing us the heart of Fathers love.